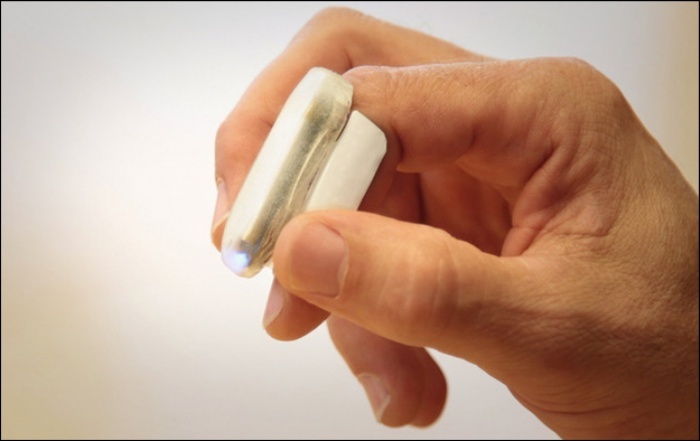 Mycestro is a Computer Mouse That You Put On Your Finger | OhGizmo! By Hazel Chua on 03/06/13 • Leave a comment! For years, people have been creating mock-ups of a computer mouse ring concept that’ll let users replace their current computer mice with something they can wear on their fingers. Now people can stop imagining because Nick Mastandrea has taken that idea and turned it into a reality with the Mycestro. The Mycestro is a 3D mouse that allows its wearer to control his or her computer with hand gestures, and of course, the basic mouse functions. The handy device is fitted with a touch-sensitive panel that you’re supposed to touch to initiate cursor movement. It connects to your computer via Bluetooth and has a range of up to thirty feet. Pretty impressive and extra useful, especially when you’re making presentations. Aside from that, the Mycestro is lightweight and charges up easily via your USB. The Mycestro 3D Mouse is currently up for funding on Kickstarter, where a minimum pledge of $79 will get you one of your very own.